Finally, something clicked. Too overwhelmed by strong feelings to really think things through, Trixie turned to Loyola. "Why are you poisoning my brother?" she blurted. "Because he's too much c-competition?" "Trixie!" Brian exploded. "Have you gone nuts or something? That's a mean, rotten thing to say!" "Trixie, what on earth are you thinking of?" Honey demanded shrilly. Trixie hadn't prepared herself for any reaction at all, much less for this. She stared at her red-faced brother, realizing this was the angriest she'd ever seen him. "Brian, I'm sorry, but don't you see?" Trixie cried. "One of the things on Moms's list of cyanide sources was apple seeds. This salad is loaded with seeds! And Loyola's been feeding it to you ever since - ever since you started this chemistry project at the beginning of the semester. And Brian - she hasn't been eating any of it herself!" Brian and Honey, shocked beyond words, gaped at Loyola. The black girl, in turn, stopped crying and looked directly into Trixie's eyes. "I had no idea the seeds were poisonous," she said simply. Too many facts were racing through Trixie's brain for her to take in what Loyola said at first. "Moms said you had been getting the poison in very small does for an extended period of time, Brian. You were going to die when it reached the toxic level!" "Trixie, didn't you hear what Loyola just said?" Honey asked. "And then when I told Loyola about your being taken to the hospital," Trixie rushed on, "she started to say something about how you had been her only competition - as if you were already dead! She always acted as if the project were much more important than your health. She never even noticed that anything was wrong with you! I know, because I asked her. Why, even Di and everyone else was worried sick-"
"That's enough," Brian ordered. "You have turned into a stark, raving -"
"No, wait, Brian," said Loyola. She took off her glasses, rubbed her eyes a minute, and put the glasses back on. "I really didn't know that about apple seeds," she told Trixie. "You've got to believe that. And I don't eat this salad because I really don't like it. You've got to believe that, too." The ghost writer of this book is thought to be Kathleen Krull. When Trixie sees a shark fin in the Hudson River, no one believes her. Brian's lab partner, Loyola Kevins, suggests Trixie talks to a friend who knows a lot about the Hudson and she tells Trixie and Honey that sharks are quite common in the Hudson. But Trixie has other mysteries to solve when Brian becomes ill from cyanide poisoning and she makes impulsive accusations when she realises the source of Brian's poisoning, only to find she has jumped to conclusions. Trixie is eager to solve the shark mystery and stop her friends from doubting her, but when she and Honey stumble on the truth they find themselves trapped in a car, sinking in the Hudson River. Thea Van Loon and her accomplices - they stole Krull's treasure from the Hudson and tried to kill Trixie and Honey. The book begins on a Sunday in October as a hurricane approaches. The concept of spoonerisms is introduced in this book and are sprinkled throughout the story. Bobby finds them particularly amusing. Dan is described as 'thin and quiet with long black hair and sideburns' (p. 18). Trixie describes Loyola to Dan as a 'short black girl with steel-rimmed glasses. Very skinny and really smart' (p. 21). 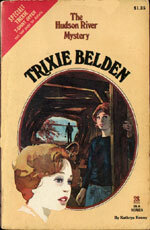 On a few occasions throughout the book, the author refers to her as 'the black girl' and she is the only 'black' person to appear in a Trixie Belden novel. Dan, Trixie and Honey go to Killifish Point to pick up Brian and Loyola, but there is no mention of how they got there to begin with! Every other visit to Killifish Point is in Brian's jalopy so it must be too far to walk (p. 25-28). Loyola's parents are dead and she lives with her eighty year old grand father in a small apartment in Sleepyside (p. 34). Is Dan the same age or in the same year as Brian and Jim? Dan goes home to study after Brian reminds him of the next day's chemistry test (p. 40). Thea Van Loon is staying in an apartment on Wentworth Avenue in Sleepyside (p. 57). Brian's birthday is on a Wednesday and he is a Libran (p. 75). It must be his eighteenth birthday, but this isn't mentioned. Counting back from Halloween (which is on a Friday), his birthday must be October 22 (p. 175). The ghost writer manages to sneak her name into the book. Pat Bunker's dead partner's name was Lawrence Krull, and his ex-wife's name was Kathleen Krull (p. 155). Bunker reveals at the end of the book that Kathleen died last year (p. 206-207). Mart has a friend named Mary Brendan who takes a stage craft class and helped him make his and Di's Halloween costumes (p. 180). He went in a paper mache shark costume, Di was a Bob-White and Trixie and Honey swapper clothes and went at Whixie Helden and Boney Treeler. The book concludes with 'A Word to Our Readers' about cyanide poisoning and apple seeds (p. 211).